For badges on manned space missions, see Mission patch. Completing training and traveling in a spaceflight, as defined by NASA or the United States Department of Defense. 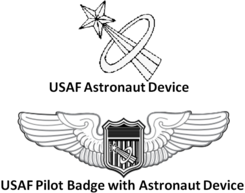 The United States Astronaut Badge is a badge of the United States, awarded to military pilots, naval flight officers, navigators/combat systems officers (this badge can also be awarded to USAF officer astronauts who are not navigators/CSOs, but who wear the same insignia while designated as astronaut-qualified Air Force "observers"), flight surgeons, and civilian pilots who have completed training and performed a successful spaceflight. A variation of the astronaut badge is also issued to civilians who are employed with the National Aeronautics and Space Administration as specialists on spaceflight missions. It is the least awarded qualification badge of the United States military. To earn an astronaut badge, a U.S. Air Force or U.S. Navy and Marine Corps officer must complete all required training and participate in a space flight more than 50 miles (80 kilometers) above the Earth. The U.S. Army has awarded the badge to officers that have orbited the Earth. In the 1960s, the United States Department of Defense awarded astronaut badges to military and civilian pilots who flew aircraft higher than 50 miles (80 kilometres). Seven USAF and NASA pilots qualified for the astronaut badge by flying the suborbital X-15 rocket spaceplane. American test pilots Michael Melvill and Brian Binnie were each awarded a commercial astronaut badge by the Federal Aviation Administration (FAA) when they flew sub-orbital missions aboard the Scaled Composites SpaceShipOne rocket spaceplane. All other men and women awarded the astronaut badge earned it travelling to space in non-winged rockets, the X-15, or the Space Shuttle. Each of the military services issues its own version of the astronaut badge, which consists of a standard aviation badge with an astronaut device (shooting star through a halo) centered on the badge's shield, or escutcheon. The United States Air Force and United States Army astronaut badges are issued in three degrees: Basic, senior, and command (Air Force)/master (Army). The senior astronaut badge is denoted by a star centered above the decoration, while the command/master level is indicated by a star and wreath. Be on active duty in the U.S. Air Force. Have a minimum of a bachelor's degree in either engineering, mathematics, biological science, or physical science, with 3 years experience. Be between 62 and 75 inches tall. No enlisted astronaut badges are yet known to have been issued. The gold astronaut device is issued by the U.S. Army to Army aviators, flight surgeons, and aircrew members that qualify as astronauts. The astronaut device is a gold shooting star and elliptical orbit which is affixed over the shield of previously awarded Army aviation badges. Army astronauts that have yet to fly a mission and have not previously been awarded any aviation badge are awarded the army aviation badge. Once they have flown a mission, they are awarded the Astronaut Device which is affixed to the shield of their army aviation badge. The army astronaut device was approved on May 17, 1983. The black version of the device and its sew-on equivalent may be worn on the Army Combat Uniform (ACU); the silver wings with gold device version is authorized for wear on Army Service Uniforms. It is believed to be the rarest badge issued by the U.S. Army. 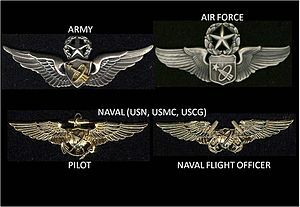 The naval astronaut insignias are issued in a single degree to naval aviators and flight officers from the United States Navy, United States Marine Corps, and United States Coast Guard, with officers of all three branches receiving their designations as aviators or flight officers through the naval aviation flight training program. All three branches also wear the same insignia which consists of naval aviator insignia or naval flight officer insignia with a centered gold astronaut device. However, the Coast Guard only issues the naval flight officer version of the astronaut insignia to its astronauts. NASA has a civilian astronaut badge, which is issued to civilian personnel who participate in U.S. space missions. The U.S. Federal Aviation Administration also grants commercial astronaut wings to commercial pilots who have performed a successful spaceflight. Two people earned Commercial Wings in 2004, and two other crews have been granted wings since 2018. The FAA Commercial Astronaut Wings design changed before the 2018 flights. NASA Civilian Astronaut Wings. FAA Commercial Astronaut Wings (2004). FAA Commercial Astronaut Wings (2018-present). In addition to the astronaut badge, which is worn on a military uniform, an astronaut pin is also issued to all NASA astronauts. It is a lapel pin, worn on civilian clothing. The pin is issued in two grades, silver and gold, with the silver pin awarded to candidates who have successfully completed astronaut training and the gold pin to astronauts who have actually flown in space. Astronaut candidates are given silver pins but are required to purchase the gold pin at a cost of approximately $400. A unique astronaut pin was made for NASA astronaut Deke Slayton in 1967. It was gold in color, like the ones given to astronauts who had flown, and it had a small diamond embedded in the star. It was made at the request of the crew of the first manned mission of the Apollo program as a tribute to Slayton's work at NASA. The idea was that everyone in the Astronaut Office had thought Slayton would never get to fly in space (due to his paroxysmal atrial fibrillation; he would later fly on board the Apollo-Soyuz Test Project as docking module pilot), however as they knew it was primarily because of him that they managed to do so, he should wear a gold pin rather than a silver one as a token of appreciation. As they knew Slayton would refuse to wear exactly the same gold pin as veteran astronauts, the diamond was added. The pin was supposed to have been flown on board the Apollo 1 spacecraft, then given to Slayton after the mission was over. However, the Apollo 1 crew died in a fire during a training exercise on January 27, 1967. The pin was given to Slayton by the three widows of the dead crew as a token of condolence. This diamond-studded gold pin was later flown to the Moon on board Apollo 11 in July 1969. One silver astronaut pin currently rests on the surface of the Moon, left there by astronaut Alan Bean during Apollo 12 in 1969. ^ a b c NASA (November 29, 2007). "Astronaut". World Book at NASA. NASA. Archived from the original on May 4, 2009. Retrieved June 16, 2009. ^ "Astronaut applications available for May board". Retrieved October 24, 2017. ^ Guha, Amita. "NASA Accepting Astronaut Applications". Retrieved October 24, 2017. ^ "Army Astronaut Device and Badges", The Institute of Heraldry, Office of the Administrative Assistant to the Secretary of the Army. Retrieved March 18, 2009. ^ Mullane, Mike (2006). Riding Rockets: The Outrageous Tales of a Space Shuttle Astronaut. Simon and Schuster. p. 88. ISBN 0-7432-9676-1. ^ Chaikin, Andrew (1995). A Man on the Moon: The Voyages of the Apollo Astronauts. Foreword by Tom Hanks. New York: Penguin Books. ISBN 978-0-14-024146-4. This page was last edited on 12 March 2019, at 22:02 (UTC).